Building on the transdisciplinary work of particle physicist and feminist theorist Karen Barad, Collocations is a work of experimental writing that explores the disruptive implications of quantum mechanics for science, philosophy and literature. 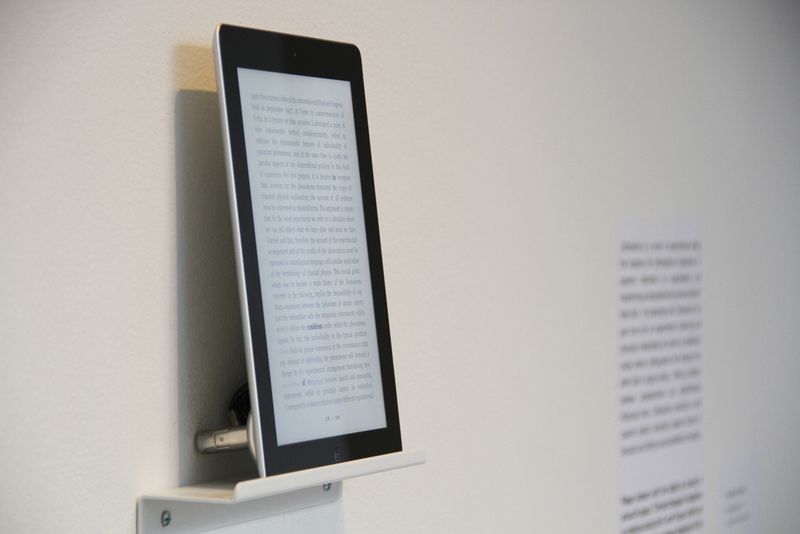 Designed for tablet computers, Collocations employs strategies of palimpsest, visual poetry, and algorithmically defined systems to produce a work of innumerable poetic texts. 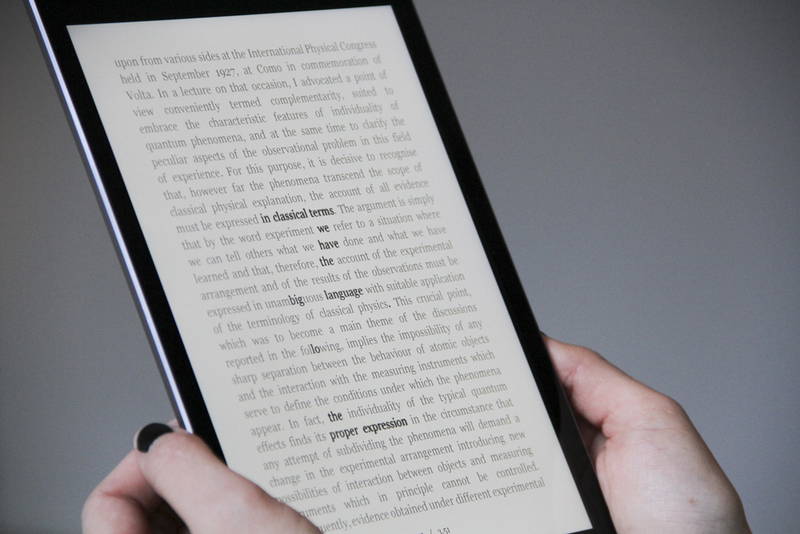 Interaction with the work transforms the user into an experimenter whose observation and physical manipulation of the device determines the materialization of any possible number of unique textual configurations in a dynamic, non-linear and kinesthetic reading experience. Collocations appropriates two key texts from Niels Bohr and Albert Einstein’s historic debates about the complementary relationship between position and momentum on the one hand, and determinacy and indeterminacy on the other. In quantum mechanics, that relationship is mediated by an experimental apparatus through which the experimenter observes the phenomenon in question. 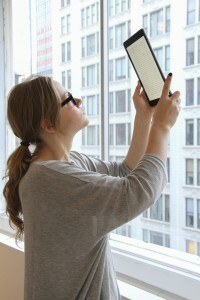 In Collocations, the tablet computer is that experimental apparatus, and the user’s manipulation of its position in space allows certain poetic texts to emerge at the expense of others. As the user moves the device, certain words from within Bohr and Einstein’s original texts begin to vibrate, becoming highlighted and forming poetic subtexts. Striking a delicate balance between completely predetermined and randomly generated texts, these poems embody the fundamental indeterminacy of matter. At the intersection of science, art, language and code, Collocations posits a new quantum poetics that disrupts classical notions of textuality and offers new possibilities for reading. Abraham Avnisan is an experimental writer and new media artist whose work is situated at the intersection of image, text, and code. Each of his projects appropriates and transforms a key 20th century text that challenges us to reconsider the most fundamental ways in which we understand ourselves and the world around us, from Freud’s Interpretation of Dreams to Albert Einstein and Niels Bohr’s historic debates about quantum physics. He has presented and exhibited his work at the Libraries at the Niels Bohr Institute in Copenhagen, Denmark, the Vild med ORD literary festival in Aarhus, Denmark, the 2015 &NOW Conference of Innovative Writing, the 2015 International Symposium on Electronic Arts (ISEA), The 2015 and 2014 Electronic Literature Organization conferences, the Museum of Contemporary Art Chicago’s Word Weekend event, and at Figment! and Centotto Gallery in New York City. Abraham’s work has been published in the 2015 ISEA Symposium Proceedings, Stonecutter, The Poetry Project Newsletter, Drunken Boat, New Delta Review, Rain Taxi, and others. He is the recipient of the Rosen and Edes Foundation Semi-Finalist Fellowship for Emerging Artists. He holds an M.F.A in Poetry from Brooklyn College and an M.F.A. in Art and Technology Studies from The School of the Art Institute of Chicago, where he received the New Artists Society Merit Scholarship. Collocations by Abraham Avnisan (teaser) from Abraham Avnisan on Vimeo.